Help! My Spell Checker Disappeared! 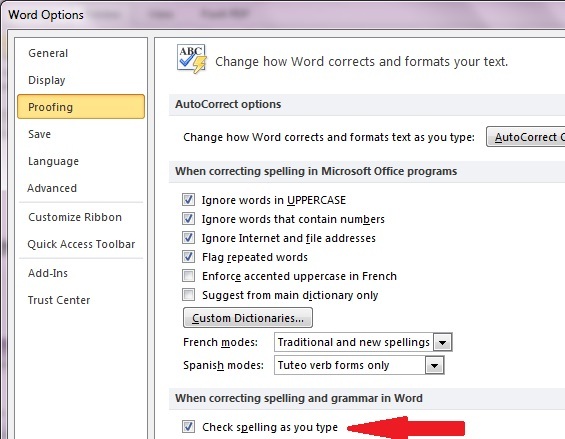 I encountered annoying problem recently: my spell checker in Microsoft WORD disappeared. I noticed a few misspellings and wondered why they weren't caught with the red squiggly line under the word automatically, and then I started getting in the habit of going to the "Review Tab" and selecting the "Spelling and Grammar" button to review the document. 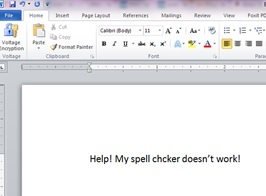 This worked fine, and as long as I kept the document open, the spell checking would continue to work. However, each time I opened WORD to create a new document, the spell checker would be off by default and I would have to remember to turn it on manually again. F7 turns on spelling and grammar. Given that I have relied on a spell checker for years, I decided this process was risky and I finally took the time to figure out what was going on. The first thing I checked is to confirm that the automatic checking feature wasn't turned off by mistake. To check this, go to the "File" tab and select the "Options" button and then select "Proofing". 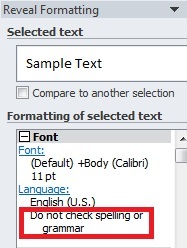 There is a check box to enable "Check spelling as you type". In my case, this was turned on already so this wasn't the problem. It appeared that my settings were correct, but the spell checking didn't work by default. After looking further I found the problem was that the language wasn't selected. Hit "Control A" to select the entire document, and then go to "Review" / "Language". Make sure the proper language is selected, and the check box that says "Do not check spelling or grammar" is NOT checked. By selecting the entire document, you can reveal settings for headers and footers. In my case, what probably happened is that the setting was turned off somewhere at some point, and the setting was just buried. To reveal a "buried" setting, hit SHIFT+F1 to reveal formatting. This is where you can find the problem. In this case, after checking everything else, the "buried" setting was found. By clicking on the "Language" link, the defaults could be changed. The spelling function was working fine in all other Office products, so it remains a bit of a mystery what happened here. If I figure out more, I'll post an update.